Meet the economic gangster. Hes the United Nations diplomat who double-parks his Mercedes on New York City streets at rush hour because the cops cant touch him--he has diplomatic immunity. Hes the Chinese smuggler who dodges tariffs by magically transforming frozen chickens into frozen turkeys. The dictator, the warlord, the unscrupulous bureaucrat who bilks the developing world of billions in aid. The calculating crook who views stealing and murder as just another part of his business strategy. And, in the wrong set of circumstances, he might just be you. 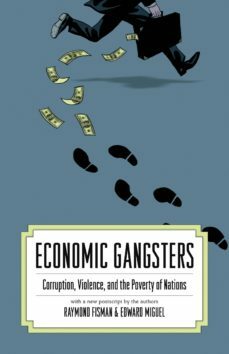 In Economic Gangsters, Raymond Fisman and Edward Miguel take readers into the secretive, chaotic, and brutal worlds inhabited by these lawless and violent thugs. Join these two sleuthing economists as they follow the foreign aid money trail into the grasping hands of corrupt governments and shady underworld characters. Spend time with ingenious black marketeers as they game the international system. Follow the steep rise and fall of stock prices of companies with unseemly connections to Indonesias former dictator. See for yourself what rainfall has to do with witch killings in Tanzania--and more. Fisman and Miguel use economics to get inside the heads of these "gangsters," and propose solutions that can make a difference to the worlds poor--including cash infusions to defuse violence in times of drought, and steering the World Bank away from aid programs most susceptible to corruption.In a new postscript, the authors look at how economists might use new tools to better understand, and fight back against, corruption and violence in the aftermath of the 2008 financial crisis. Take an entertaining walk on the dark side of global economic development with Economic Gangsters.